POLL: 67% Of Republicans Back Trump On Nazis - Joe.My.God. Nearly two-thirds of Americans consider the attack that led to loss of life in Charlottesville an act of “domestic terrorism,” a view that spans partisan lines. 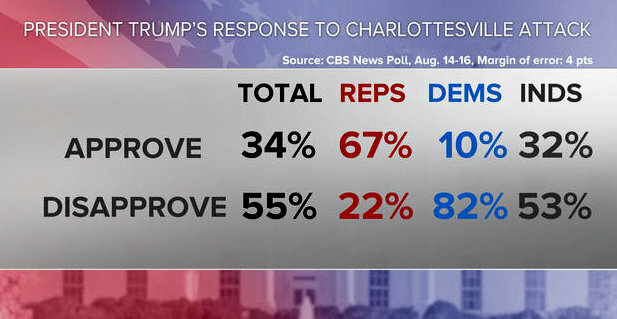 But President Trump’s response to Charlottesville finds more division. He gets majority disapproval overall for his response to the events, while most Republicans approve. Republicans interviewed following Tuesday’s press conference also feel Mr. Trump is assigning blame accurately in the matter, while Democrats and Independents, and the country overall, disagree. Post-Tuesday afternoon, views on the president’s description of events are tightly tied to overall views of his handling of the matter. Independents and Democrats, and the country overall, feel his description of blame in the events is inaccurate; Republicans feel it is accurate.